(Atlanta, Georgia)… The Commonwealth of The Bahamas received a major plug when actress Keshia Knight Pulliam revealed she will be bringing her girls’ camp to the islands. 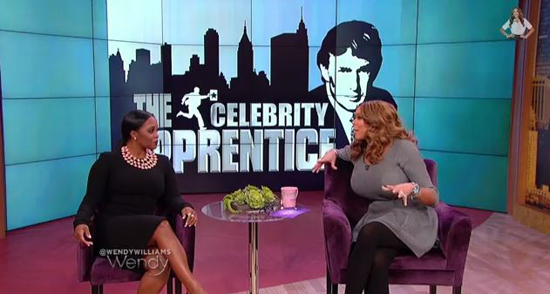 Knight Pulliam made the announcement on the Wendy Williams Show during her appearance as the first fired cast member of Donald Trump’s “Celebrity Apprentice” on Monday, January 5, 2015. After talking about her one episode run and the controversy surrounding tv dad Bill Cosby, who made her a star when he casted her as a Rudy Huxtable on “The Cosby Show”, Knight Pulliam went on to talk about her non-profit Camp Kizzy. “The Meet The Browns” star who is a Spelman graduate explained how she used her sociology degree to map out the plan for the organization which is now in its fifth year. “I’m doing Camp Kizzy Bahamas with the government of The Bahamas,” she beamed to Wendy Williams after announcing a boys’ camp will also be launched this year. Confirming Knight Pulliam’s Camp Kizzy will be in The Bahamas for summer 2015 was Bahamas Consul General to Atlanta Randy E. Rolle whose office has worked with the actress several times in the past.